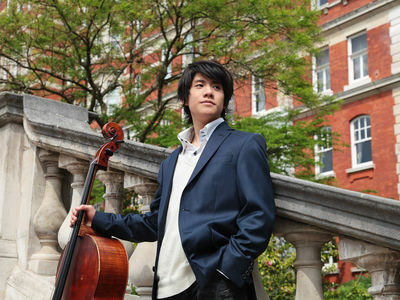 Multi-award winning cellist Yuki Ito is one of the most prominent young cellists in Japan, based in London since the age of 15. He first came to international attention when he won 1st prize at both the International Johannes Brahms Competition in Austria and the Windsor Festival International String Competition in the UK aged 21, and made his major début with the Philharmonia Orchestra at Windsor Castle in 2011. He has since performed with many renowned orchestras and artists as Vladimir Ashkenazy, David Geringas and Julian Lloyd Webber. Including legendary author Kenji Miyazawa’s 120th birth anniversary recital for worldwide TV broadcast by NHK Japan (100th anniversary soloist was Yo-Yo Ma), his solo recitals at halls with more than 1,000 audiences sell out in Japan, where he is often on TV and radio. His worldwide recital invitations have taken him to London’s Royal Festival Hall, Wigmore Hall, Royal Albert Hall, as well as a private recital personally invited by HRH The Prince Edward, Europe (Paris, Rome, Salzburg etc. ), North America, Asia and Africa, giving world premieres of works dedicated to him. He is especially noted for playing Rachmaninov's works and introducing English Music in Japan, with his début album “Rachmaninov Complete Cello Works” receiving critical acclaim internationally, chosen as Recommended Disc by The Strad UK describing “Ito triumphs in Rachmaninov…Sensational recital”. His 2nd album will be released from Sony Music on 15/Nov/2017. He studied with David Geringas and Alexander Boyarsky, and graduated from the Royal College of Music in 2015. YCA Artist, CHANEL Artist. He founded In Tune Orchestra (ITO) in 2013 and has since been active also as conductor.